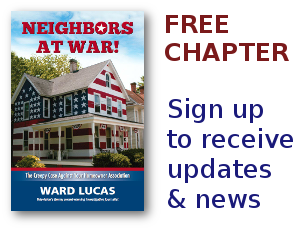 Las Vegas Homeowners Associations Archives - Neighbors at War! A reporter for Channel 8 News in Las Vegas tried to help a homeowner in the Terra West Homeowners Association. It seems the woman, Esther Sardina, had inadvertently underpaid her HOA dues by twenty cents. The woman wrote a check to the HOA for a dollar but they started hitting her with late fees anyway. So this reporter swung into action, confronting a board member. Terra West dropped the fine. But that’s beside the point. This HOA board simply doesn’t want this woman living in the neighborhood. They want her gone. No HOA puts a 42 cent stamp on a fine for 20 cents…unless they’re intentionally trying to provoke an expensive fight where both sides have to run out and hire lawyers. No Comments on THEY GOT HIM!!! Nevada has some slimy creatures. But this one has finally been nailed by the U.S. Attorney. Las Vegas huckster Leon Benzer has at long last been indicted for leading the organized crime ring that bled untold tens of millions of dollars out of that state’s Homeowners Associations. Benzer has claimed innocence all along. In fact, he’s now saying that he got personal approval for running his racket by the Nevada Attorney General. 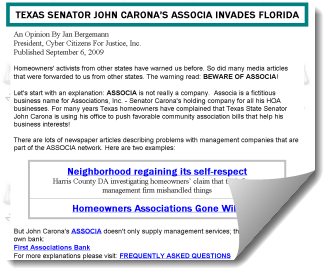 While that’s totally believable, the HOA scam was totally unbelievable. More than two dozen participants have already pleaded guilty to rigging HOA board elections so they could put phony straw men on the boards and divert millions of dollars to Benzer, a bunch of lawyers, a few police officials and a politician here and there. Jeff German of the Las Vegas Review Journal is one of the few who’s done ongoing stellar work in reporting on the massive Nevada HOA scandal. 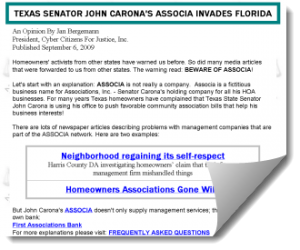 If there are still any skeptics in America who think I’ve been exaggerating about the American HOA Movement being rife with old fashioned organized crime, then please follow German’s reporting.